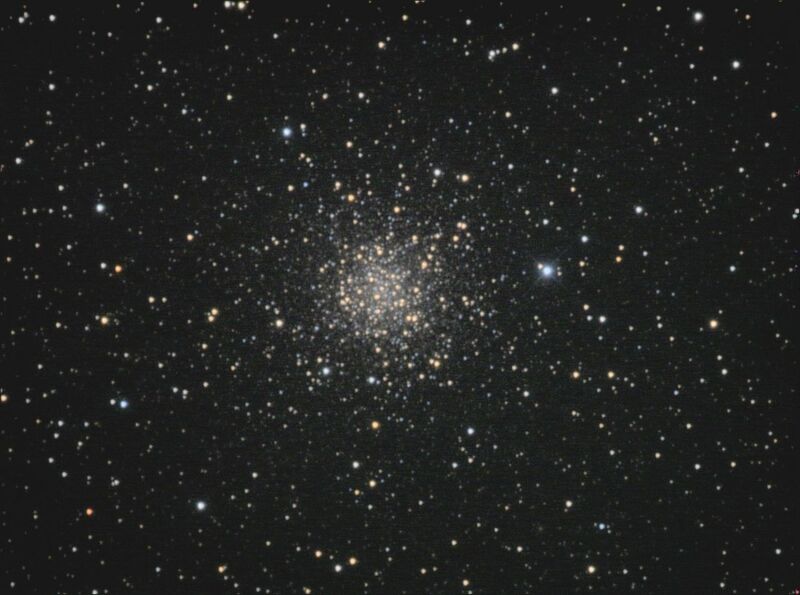 Messier 56 (M56) is a globular star cluster located in the small northern constellation Lyra. M56 has an apparent magnitude of 8.3 and lies at a distance of 32,900 light years from Earth. 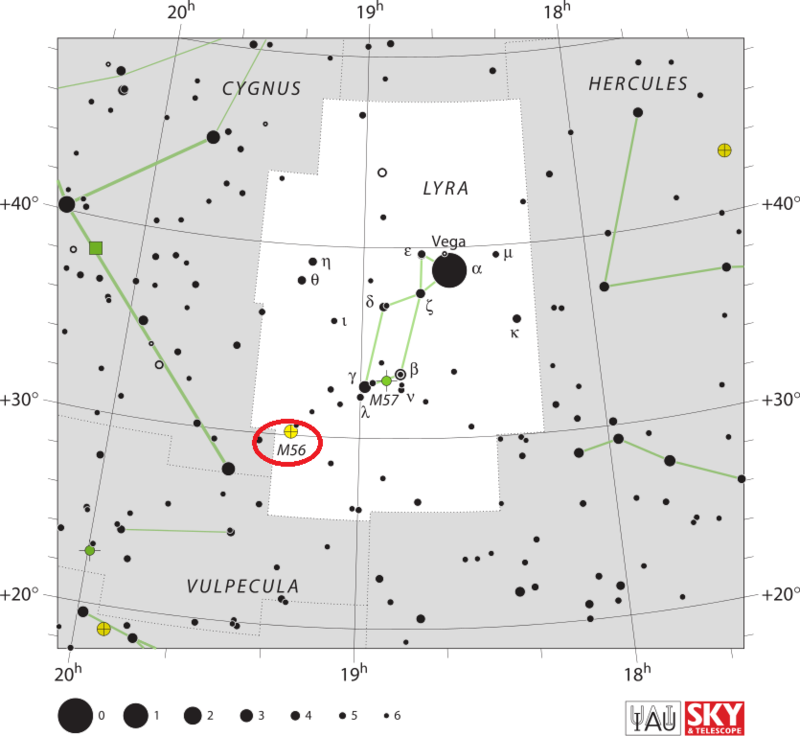 The cluster has the designation NGC 6779 in the New General Catalogue. Messier 56 is relatively easy to find because it lies roughly halfway along the line from Albireo, Beta Cygni, to Sulafat, Gamma Lyrae. Albireo, a famous double star, marks the beak of the celestial Swan and the base of the Northern Cross, while Sulaphat can be located in Lyra, on the opposite side to the bright Vega. The cluster can be a challenge in binoculars because it is quite dim and does not have a bright core. In large binoculars, it appears as a fuzzy patch or an out-of-focus star. To resolve it into individual stars, one needs an 8-inch or larger telescope. 4-inch telescopes show a round ball of light, but do not reveal much detail. Visually, observers can only see the cluster’s central region, about 3 arc minutes in diameter. The best time of year to observe M56 is during the summer months. 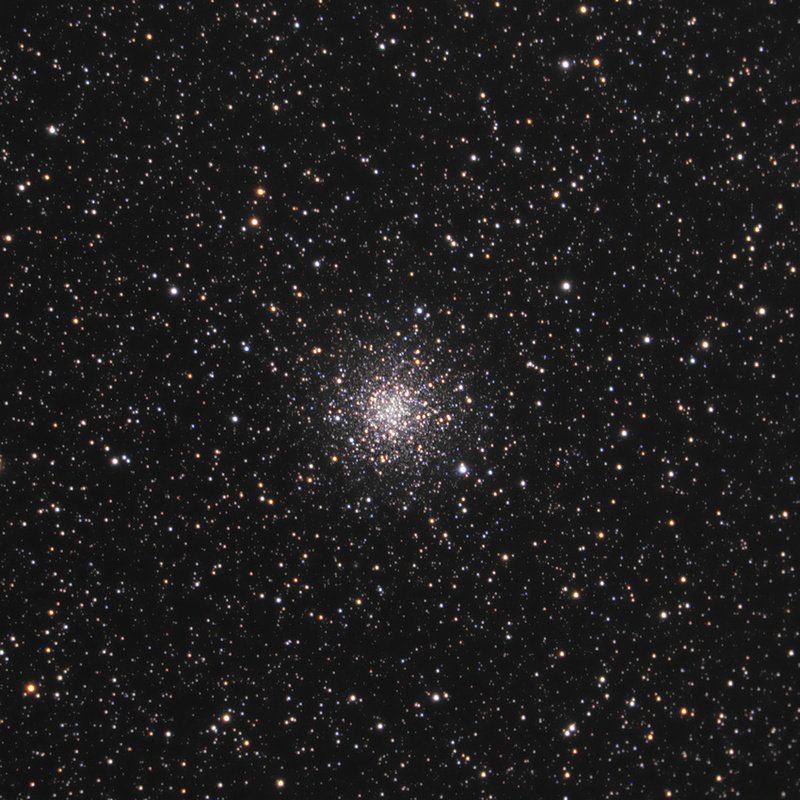 Messier 56 occupies an area of 8.8 arc minutes, which corresponds to a linear diameter of about 84 light years. It has a mass about 230,000 times that of the Sun. The estimated age of M56 is 13.7 billion years. The cluster has only 1 percent of the Sun’s metallicity, or abundance of elements heavier than hydrogen and helium. The overall spectral type of M56 is F5. The cluster is approaching us at 145 km/s. The brightest stars in M56 are of 13th magnitude and the 25 brightest stars have an average visual magnitude of 15.31. The cluster is known to contain about a dozen variables, including the RV Tauri variable V6, the irregular variableV2, the semi-regular variable V3, and the Cepheid variable V1. Messier 56 follows a retrograde orbit through the Milky Way moving at an estimated velocity of about 177 km/s. It is about 31,000 to 32,000 light years from the galactic centre and 4,800 light years above the galactic plane. The properties of M56 indicate that the cluster may have become part of our galaxy when the Milky Way devoured a dwarf galaxy. The nucleus of the smaller galaxy is believed to have survived as Omega Centauri, the famous globular cluster located in the southern constellation Centaurus. Messier 56 is located relatively close to Messier 57, the famous Ring Nebula, which is the only other Messier object found in Lyra. Nebula without stars, having little light; M. Messier discovered it on the same day as he found the comet of 1779, January 19. On the 23rd, he determined its position by comparing it with the star 2 Cygni, according to Flamsteed: it is near the Milky Way; and close to it is a star of 10th magnitude. M. Messier reported it on the chart of the comet of 1779. 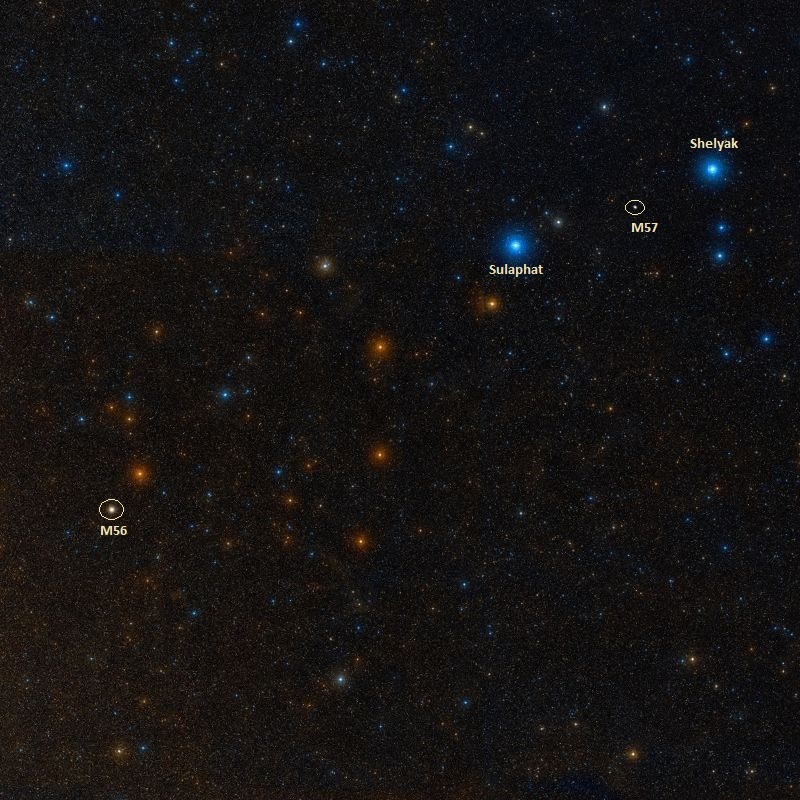 A globular cluster, in a splendid field, between the eastern joke of Lyra‘s frame and the Swan‘s head: it is 5 1/4 deg distant from Beta Lyrae, on the south-east line leading to Beta Cygni, which is about 3 1/2 deg further. This object was first registered by M. Messier in 1778, and, from his imperfect means, described as a nebula of feeble light, without a star. In 1784, it was resolved by Sir William Herschel, who, on gauging, considered its profundity to be of the 344th order. 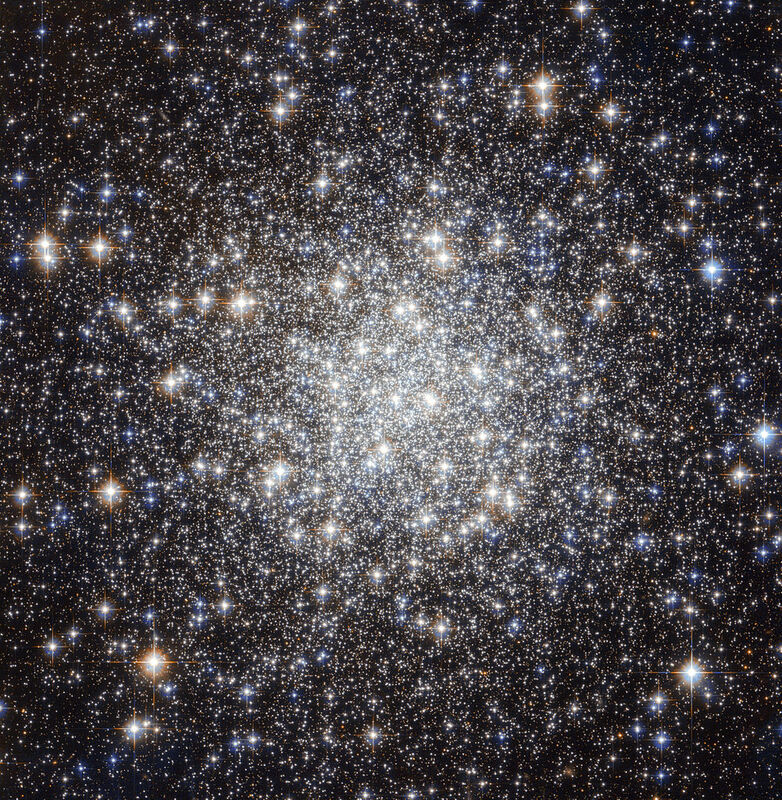 Image of M56 taken by Robert J. Vanderbei, Princeton University.